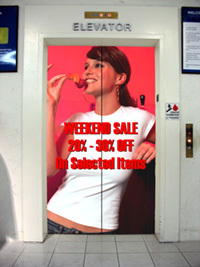 FLx-Banners and FLx-Billboards™ are lightweight, easy to use, flexible-fabric display advertising signage systems. These are perfect to promote your company brand or logo (either indoor or outdoor) for store and retail promotions, real estate sites, shopping centers, outdoor sporting events, and other event occassions. Each unit comes equipped with a canvas storage bag, support poles and frames for effortless pack-away, transportation or storage. Complete with both side imprints and small ground platform/stakes to ensure stability. Easily can be installed alone without assistance and takes a few moments to set up. Inflatable Domes are ideal for creating that "extra special" attenton for your event. 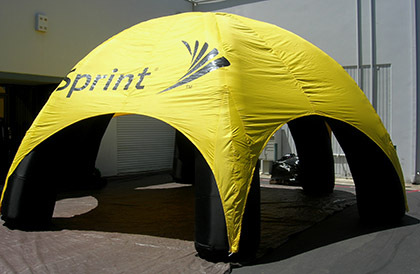 Pefect for craft shows, flea markets, art festivals, sport events, trade shows, or anywhere you need a portable shelter. Domes are a great way to promote your business while simultaneously keeping you protected from the elements. Available in most colors and are made of either Nylon, Vinyl-Coated Nylon, PVC, or a combination of these materials. Pop-Up Tents are designed for optimum sun protection and shade. Canopies feature and are constructed with the highest of quality materials - The 100% polyester top is made 600 denier, heavy-duty, water-resistant, fire retardant and UV-protected. Even choose the painted aluminum frame which weighs 30% less than most steel frames. Convenient, these portable canopies can be transported easily and will make your brand visible on all sides, peaks and valances. ABA™ Fabric has a look and feel to which vinyl doesn't compare. Wind and water-resistant, it easily can be removed, re-positioned, and re-applied to a variety of surfaces; car doors, windows, billboards, pillars, walls, tables, desks, backdrops, banners, vending machines, elevator doors, golf carts, and much more. The revolutionary adhesive and re-adhesive fabric makes mounting it on and most surfaces extremely easy - it is even forgiving should you make a mistake. Simply peel it off and re-position. Virtually eliminates the need for hiring professional installers.